Rivaldo Vitor Borbora Ferreira is a name synonymous with the Brazilian footballer legends. He was on the team that won Brazil the World Cup in 2002, where he was the second highest goal scorer. He was on the team that took Brazil to the finals in the 1998 World Cup. He is known for his magic left foot, his marvellous game strategy and his excellent bicycle kicks. Rivaldo, however, started his life with a very unpromising background. He grew up in a slum in Recife, a small town in Brazil. As poverty abounded, Rivaldo and his family fought to stay alive and he faced the brunt of it all by being a victim of severe malnourishment. He lost some of his teeth as a result, and his bones became brittle, making him bow-legged. His muscles were left underdeveloped, even as he stood at 6+ feet. Despite his debiliating physical condition, Rivaldo harboured a dream of playing football professionally. It was almost an escape for him, from the harsh realities of life – but it gave him hope. He would walk many miles to and from his training ground because he couldn’t afford transport. 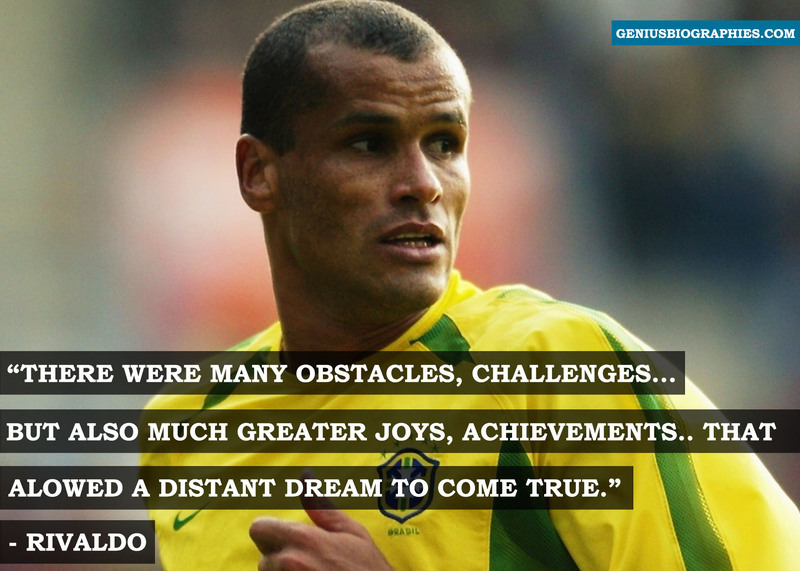 Just when his career was about to take off, Rivaldo lost his father to a road accident. He was shattered, and almost gave up football. But he soon realised that he wanted to make his – and his father’s – dreams come true, and that quitting was not an option. With no financial support, Rivaldo had to sell refreshments & souvenirs to tourists by the sea to feed his family. But his love for football was far from over. Every night, while the whole world slept, Rivaldo would walk miles to the football ground and train with all his might. His father had always urged him to pursue football – and driven by this guiding light, Rivaldo finally signed his first professional football contract with Paulistano, at the age of 16. Even as his coaches expressed their fears about Rivaldo not being strong enough to take on the high demands of the rough game because of his frail physical appearance, Rivaldo hushed them all with his tremendous skill involving his left foot, and his keen strategizing. The rest as they say, is for all to see. Always find a way to keep your passion alive – no matter how hard the path ahead looks like, your passion will find a way to tackle it beautifully. The path is often ridden by blockages at several intervals. Don’t be disheartened, because they are there to make you stronger and better at your game.